It was only this morning when a worthy contributor at HotWhopper remarked on an article in the Telegraph, in which Tom Chivers referred to this sort of ugly response to the ice-bound ship in Antarctica as trolling. We then observed how anyone who discusses science at WUWT is commonly referred to as a troll. And the first sentence I read in that new article is this? It has become a favorite tactic amongst trolls to declare their belief in peer reviewed science. With this simple strategy, they at once excuse themselves from the need to know anything about the science, and at the same time seek to discredit skeptic arguments on the grounds that, not having been published in peer reviewed journals, they may be dismissed out of hand. they are sensible enough to realise that if 97% of the thousands of experts agree, then it's probably wise to pay attention. In the fifth century BC (ca. 495–435 BCE), there was a philosopher physician poet whose name was Empedocles. Empedocles was a very important influence and features in the work of Plato and Arisotle among others. He posited that we see objects because they emanate colour which is perceived by the eye. It's a fair bit more complicated than that. David Hoffer describes it as "Empedocles theorized that one could see by virtue of rays emanating from one’s eyes." However from what I've read (here and here) it was the other way around. And it wasn't "rays" it was effluences, which to my mind has a slightly different meaning. It's more like objects emanate effluences of different colours which are received by the eyes. Falsifying this notion required no more than pointing out that one cannot see in a dark room. Well, that might be okay if David's notion of Empedocles' ideas was correct and complete. However from what I've read, Empedocles was quite a clever chap and I don't think that he would have come up with a notion that could be so easily dispelled. So I think it much more likely that Empedocles notion may be more as described by Katerina Ierodiakonou (p 22 onwards). It's a thoughtful treatise and one which I am not in a position to judge as to accuracy, not being a scholar of ancient Greece. I'm drawn to the similarities with our knowledge of light and vision, rather than the differences. And I have to admit that the dreamer in me is attracted to the merging of philosophy and natural sciences. Before I get too carried away, best return to the mundane. David has raised this flawed "argument" before as you may recall. The nuts and bolts of it is, if a single Greek philosopher physician and poet could be mistaken about light and vision back in the fifth century BC, then today all the scientists in the world must be wrong about modern physics, chemistry and biology. We could extend that and argue that all the physicians and medical researchers in the world are wrong about vision. And all the physicists in the world are wrong about theories of light. In fact, all modern science could be wrong. It could even be that Empedocles is correct after all, couldn't it? What it boils down to is that David M Hoffer is arguing that pigs might fly. Just because there isn't a peer-reviewed paper proving that pigs can fly doesn't mean that they can't. ...retreat to authoritarian arguments in the face of dead simple observations. David calls on Galileo Galilei to support his notion that all the scientists in the world have had it wrong for decades. This is rather odd, because Galileo was a scientist who was battling with fake sceptics who didn't like him or his science largely because of political ideology (the Church and politics were intertwined back then). Just like all the fake sceptics at WUWT. So it's not at all clear why David would call on him for support. If Galileo were alive today he'd be horrified to discover the anti-science mob claimed him as one of their own. Another thing, David M Hoffer disputes the fact that Tom Wigley is the ruler of the world. He reckons that its Kevin Trenberth, who he says is "arguably the most politically powerful climate scientist on earth". They are a fickle lot this anti-science crowd. 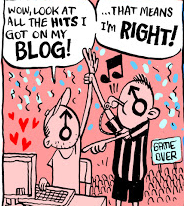 Maybe there'll be a stand-up fight between David M Hoffer and Tim Ball. Who's going to place a bet? But you need not believe me in that regard. 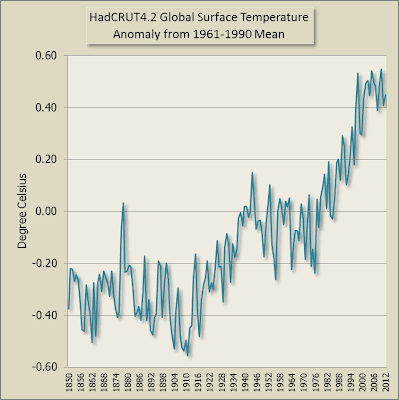 Just the peer reviewed science by the foremost climate scientists on earth. ‘Peer review’ may become ‘pal review’, or less politely a ‘circle jerk’ of like-minded colleagues boosting one another’s fortunes. Well done, David M. Hoffer (if I may, smile). Glad to see an article by you. When I saw you were this post’s author, I even came off my WUWT vacation to read it. You (and other WUWT science giants) certainly provided irrefutable demonstrative evidence of your above assertion in your valiant attempt last week to educate that troll-of-contrived-ignorance whose name I will NOT give the benefit of even mentioning ( = home for a legion of rabbits, going nicely with Monckton’s hive metaphor in the post below which your comments appeared). Warmist “peer review” is as dishonest as their pseudo-scientific religion. Peer reviewed climate science seems to be little more than the art of ignoring one’s ignorance for the greater good of the clique. 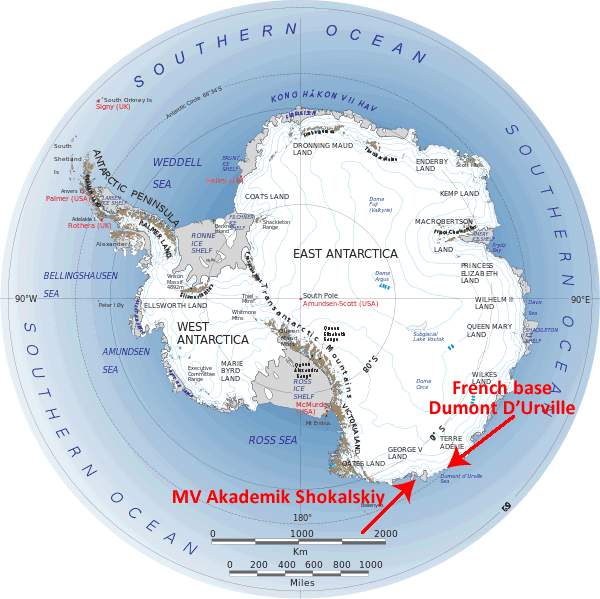 Maybe five percent of the hydrosphere has been visited? Never mind. Almost all of the hot, plasticky ball called Earth unvisited, unexamined? Bor-ing. Get to all that later. Gotta publish. Is there some law that says if you’re having an argument about science and you compare yourself to Galileo you automatically lose? I try to actually introduce as many of my friends to your excellent website as a focus of general science (which it does a better job than fully dedicated ones) but when ironic S@*te like this appears it dilutes some of the excellent pieces posted here. Oh dear – a paper which starts by defining anyone who dares question the views of the author as a ‘troll’. The beauty of this bit of sophistry is that the author virtually sets up, and automatically ‘wins’, a circular argument: trolls are wrong and bad. Hoffer is not a troll. Therefore D Hoffer is right! Verbal alchemy – logical dross into gold! Another (recycled) cacophony from Anthony Watts. No, it's NOT the sun stupid! The thing is, all Anthony did was demonstrate once again that he's a complete nincompoop when it comes to climate science. He can't write a coherent or logical article and doesn't know the first thing about the subject. And this is despite the fact that he's been (ostensibly) blogging about weather and climate for six years or so.
.@wattsupwiththat How can someone be against a particular kind of forcing? Very strange comment. PS. Wait for my next paper. Cowardly? Not on your life! Anthony started off badly, calling Gavin Schmidt "cowardly" for appearing on Fox television but declining the request to "debate" with Roy Spencer. Cowardly is not even the last word that any sane person would think of to describe Gavin Schmidt - respected climate scientist, Deputy Director, NASA Goddard Institute for Space Studies, climate champion, climate hawk, pioneer in blogging about climate science - bringing science to the people, recognised by the scientific community for his contribution to science communication, courteous and polite even in the face of provocation etc etc. Many people would regard Gavin Schmidt as a hero, not afraid to speak out on behalf of humanity. Cowardly - never. Television is performance art, not scientific debate. We shouldn't confuse the two. "It's just a cacophony...I'm not interested in adding to noise..."
There are fora in which you can have a serious conversation. And there are fora in which it's almost impossible. Debate situations where you have "no no no no" "yes yes yes yes" - it's just a cacophony and often is just literally people talking over each other. It serves nobody's purpose other than the producer who thinks they had a fiery segment on their TV show. I don't do those kind of things. I was on Fox Business News a few months ago and they tried to set it up as a debate with Roy Spencer and I said, "Look, I don't want to, I'm not going to, I'm not here to make good TV for you. If you want to ask me questions, if you want to understand what we as a community understand about the science then I'm happy to talk to you." And I did. And I talked to him and I explained things. And then he said: "Oh well, you know what. I've got Roy Spencer over here in the wings. I'll bring him on and now you can have a debate." And I said: "No. I don't want to have a debate with people. Because it's just noise. And I'm not interested in adding to noise." Right. Now some people are. Right? Some people want to add noise to the discussion. And if that's what you're advocating - more noise, and there are people who are doing that, nobody here. Then, you know, go ahead. But you know the things that I advocate for basically are a higher level of conversation. Right? And that means avoiding noise in order to have serious conversation. Standing up for your principles on camera on a widely viewed television show is the absolute opposite of "cowardly". If only more people would have that sort of courage. Anyway, that's how Anthony Watts set the scene - positing that this renowned climate scientist and award-winning climate communicator, who speaks out to inform the public about climate science, is somehow "cowardly". And Anthony labels Dr Schmidt "cowardly" because he refused to put aside his principles and stood up to a popular television entertainer/presenter, John Stossel. To Anthony Watts - (yawn) - it's not the sun, stupid! Yes, it is interesting to think that the sun may have played a role in the Northern Hemisphere cold spell during the Maunder Minimum (see Leif Svalgaard's cautionary comment below), but not in the way that Anthony Watts wants his readers to think. 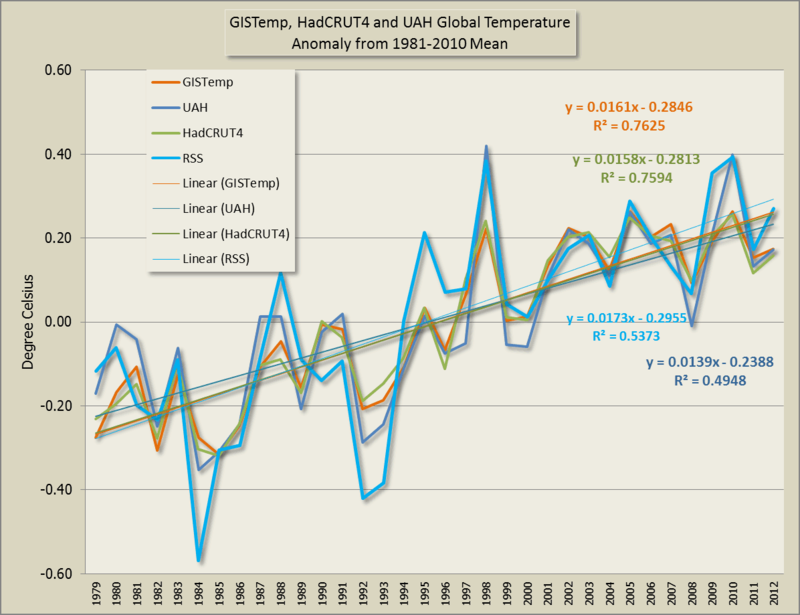 Here is an chart from the IPCC AR5 WG1 report, which I've animated to illustrate all the above. As always, click to enlarge. I note in the comments that Leif Svalgaard says that the Shindell paper is based on information about solar activity that is now seen as erroneous. I don't know to what extent the IPCC chart above reflects current thinking about TSI. Yet neither Gavin nor any reputable climate scientists would argue that "the sun can only force the climate one-way" (nor that "the sun can only force the climate one way"). If Anthony stopped to think for a second he'd realise that if there were no solar irradiance then earth would be frozen solid - that's if there were any water on Earth in that situation. 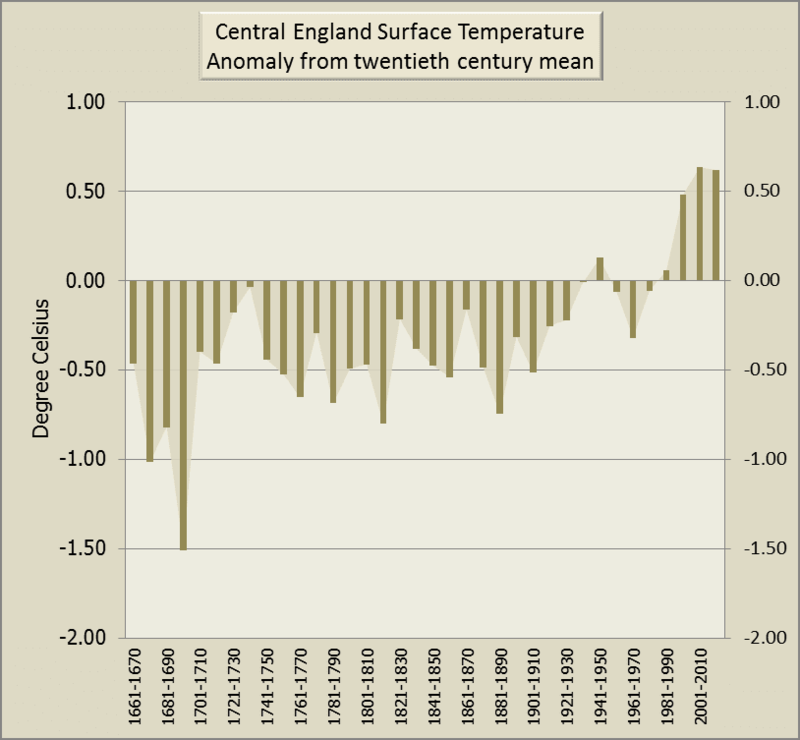 It's because of solar forcing that Earth is warm. That plus greenhouse gases of course. And in the chart above you can see how when there is higher solar irradiance the temperature goes up and when there is less the temperature drops. The solar forcing works both ways. But when there is another forcing, like from a volcanic eruption, that acts on top of the solar forcing. 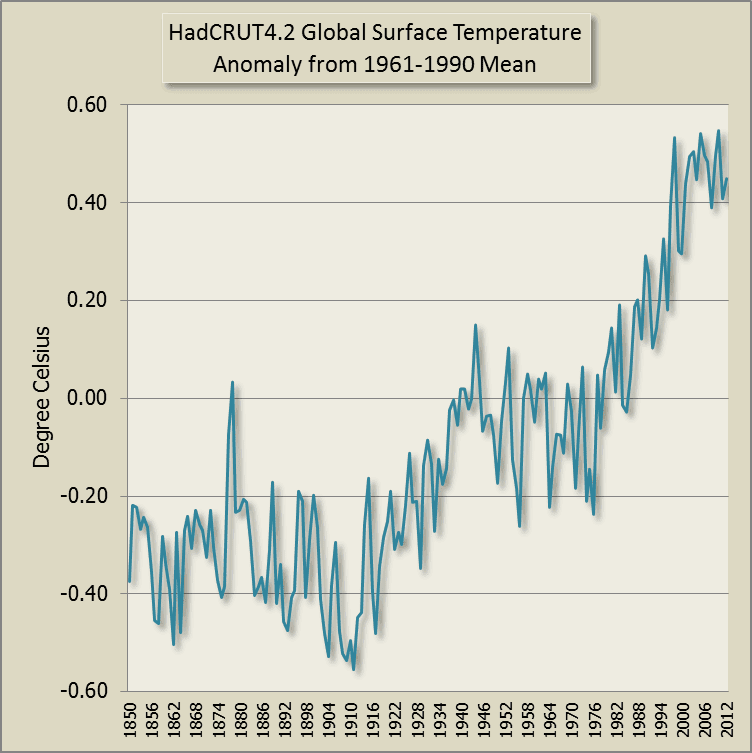 And when there is yet another forcing like adding more greenhouse gases, that adds to any solar and volcanic forcing. Anthony seems to be trying on the old "it's the sun". If one took Anthony's article to its logical conclusion and ignored any forcing except incoming solar irradiance, then earth should be quite cold instead of being as hot or maybe even hotter than it's been since the Holocene Optimum. Because Gavin Schmidt and Michael Mann are scientists, not nincompoop fake sceptics who talk through their proverbial hats, if the earth cooled down in the next two decades I've no doubt they would be able to explain what caused it. It won't be the sun unless it somehow reduced it's radiant output to levels not seen in millions of years. And that's unlikely from a scientific perspective. A supervolcano or two would probably do the trick. Or a major nuclear war. Or someone playing god by some massive geoengineering venture. In fact, Gavin Schmidt and Michael Mann are way ahead of Anthony Watts. Two and a half years ago they posted an article on their website realclimate.org, discussing what would happen if there were a Grand Minimum. They understand climate forcings a bit better than Anthony does. Solar physicists do not yet understand how an extended solar-activity low like the Maunder Minimum arises. Yet there is recent observational evidence for an unusual behavior of the Sun during the current cycle 24, including a missing zonal wind flow within the Sun, decreasing magnetic field strength of sunspots and lower activity around the poles of the Sun. These observations prompted Frank Hill and colleagues to suggest that the Sun might enter a new Maunder-like minimum after the current 11-year cycle ends (i.e. after 2020 or so). Figure 2. 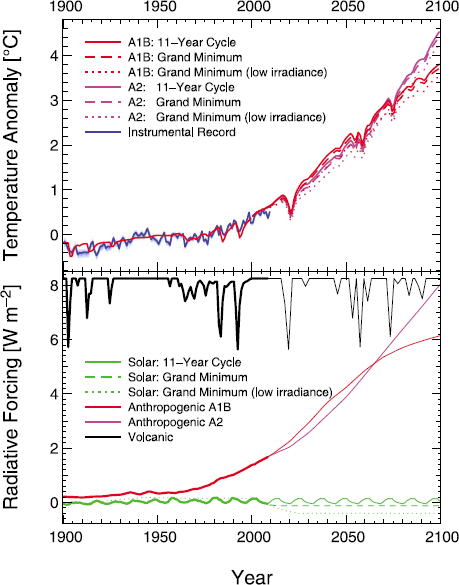 (top) Global mean temperature anomalies 1900–2100 relative to the period 1961–1990 for the A1B (red lines) and A2 (magenta lines) scenarios and for three different solar forcings corresponding to a typical 11‐year cycle (solid line) and to a new grand minimum with solar irradiance corresponding to recent reconstructions of Maunder‐minimum irradiance (dashed line) and a lower irradiance (dotted line), respectively. 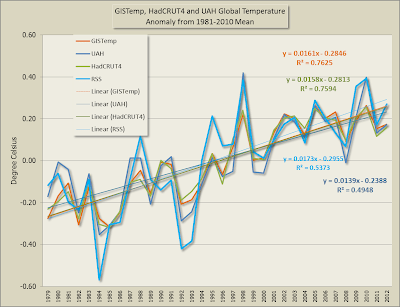 Observed temperatures until 2009 are also shown (NASA GISS [Hansen et al., 2006], blue line and shaded 1s and 2s error ranges). (bottom) Radiative forcings used in the simulation experiments, with observed values until 2008 marked by thick lines. 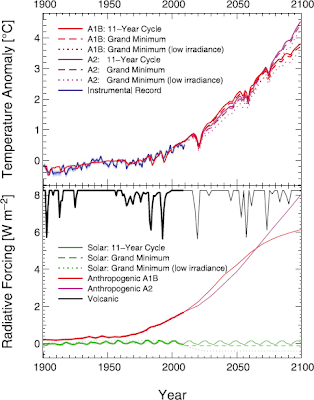 Volcanic radiative forcing has been shifted by +8.25 W m−2 for clarity. The upshot is that if there were a Grand Minimum, global surface temperatures may rise by, for example, 3.7°C by 2100 instead of 4°C if we keep emitting vast quantities of CO2. Anthony is finding it hard to come up with new denier memes, although yesterday he came up with a variation of a classic climate conspiracy that I hadn't come across before. 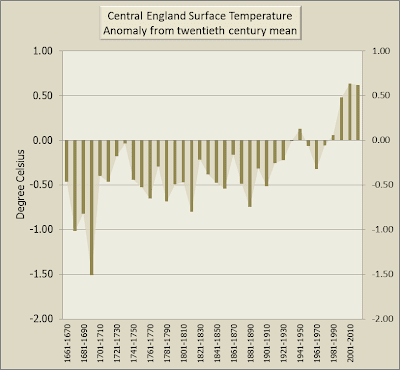 A mini-ice age? Not from the sun. Cooling? If so, it won't be because of greenhouse gases. 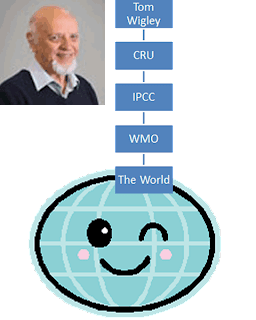 And I'll bet you that scientists are able explain variations in the global surface temperature and that Anthony Watts will reject them - since he rejects almost all climate science. That's why, despite his objections, Anthony Watts is known, if he's known at all, as one of that ratty mob of climate science deniers. ...After all their beliefs have nothing to do with science and everything to do with money and faith. I truly think that it is honesty that is missing in the climatology realm more than there being a lack of common sense. I am not being cynical or snide with this comment; I can not explain the alarmist’s position that anthropogenic CO2 drives the climate and will burn us to a crisp other than to believe they are dishonest.